It may be downloaded here. In a surprise move, apparently in the wake of Brexit planning, the UK has announced it will no longer participate in the European Union’s nuclear agency Euratom. 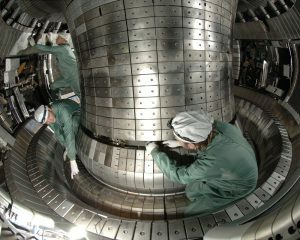 This could lead to less funding for the world’s largest fusion experiment, the International Thermonuclear Experimental Reactor (ITER) in Cadarache, France. Billions of dollars in research into hot fusion has resulted in very little and potentially misleading progress, while modestly funded LENR firms, such as Brillouin Energy, have demonstrated excess power in repeatable testing. 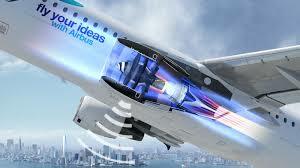 Airbus continues to position itself for the application of LENR technology by applying for two additional patents. In 2015, Airbus also published a patent for LENR power generation. Tokamak Energy, from Oxfordshire, believes that the third version of their compact, spherical tokamak reactor will be able to reach temperatures of 100 million degrees Celsius by 2020. That’s seven times hotter than the center of the sun and the temperature necessary to achieve fusion. Tokamak Energy says its technology would be similar in costs to a nuclear fission plant, but without any fissile material and with no risk of meltdown. The company’s CEO, David Kingham, believes it will be possible for his team to transfer energy to the grid by 2030. Perhaps this is a bit self-serving, but if these statements are true, Tokamak reactors could challenge the current LENR projects vying for commercial success. 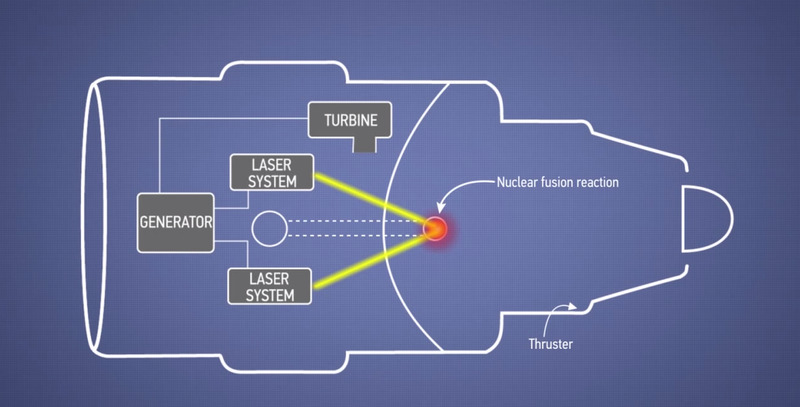 Fresh on the heels of the Airbus LENR patent, Boeing has now applied for a patent for a engine making use of a thermonuclear fusion process powered by lasers. Our readers will certainly see the LENR undertones to this patent. Read the full article here. The race for the next generation power source for aviation is heating up and LENR – Cold Fusion is certainly among the handful of potential candidates. 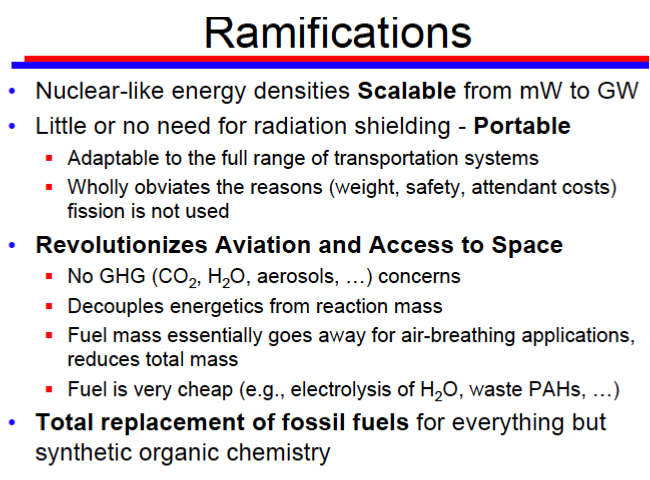 Last week, NASA, under the pressure of an FOIA request, released the power point slides from an internal presentation in which three of its senior scientists discussed the nature of LENR and its impacts on space and air travel. NASA has been funding LENR research in the U.S. and has had continuing discussions with Andrea Rossi and other scientists working in the field for many years. NASA’s Joseph Zawodny concludes that LENR is indeed a form of nuclear power, but not what is commonly thought of as “cold fusion.” Zawodny believes that the transformation of one element into another is consistent with neutron absorption as other scientists claim. He goes on to point out that under one theory of what is happening, decay products of the reaction are turned into heat and gamma rays are screened out. In comparing the energy output of LENR to fission, conventional fusion, and chemical reactions, Zawodny notes that LENR is theoretically capable of producing 8 million times as much energy as a comparable chemical reaction. This of course explains why a very slow reaction can produce excess heat while consuming only minimal amounts of hydrogen and nickel.